Following last months Powdery Mildew Workshop in Eger, Hungary, I toured eastern Hungary; Tokaj and Debrecen, before travelling to Belgrade, Serbia, and Sarajevo and Mostar in Bosnia and Herzegovina. Bosnia and Herzegovina was particularly beautiful with winding roads ambling through the rugged, peak and valley filled country. Driving was a challenge here, but well worth it for the stunning views, which quickly became formality, and the character-filled cities of Sarajevo and Mostar. Mycologists Unite! EMA delegates at the venue. Having completed my PhD, I attended this and the Powdery Mildew Genomics Workshop in between jobs and therefore without funding. The Marsh Christian Trust Horticultural Science Award I had been presented with the previous year enabled this travel and I am especially thankful for this. The final country of my journey has been the Republic of Macedonia. 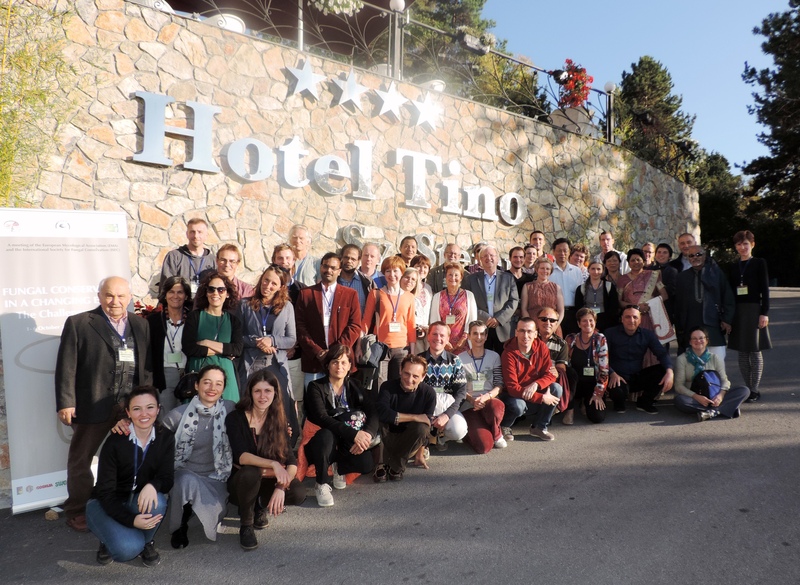 Here, a week long European Mycological Association conference entitled “Fungal conservation in a changing Europe: The Challenges Ahead” was based on the shore of Lake Ohrid, in the south-west of the Republic of Macedonia. Scientists present represented an array of countries from across Europe, as well as further afield; China, India, Malaysia, South Africa, and USA. The meeting was hosted by the Macedonian Mycological Society and Ss. Cyril and Methodius University, from Skopje, and ran in association with the European Council for the Conservation of Fungi (ECCF), and the International Society for Fungal Conservation (ISFC). As the meeting title suggested, the main focus was on fungal conservation and we were treated to reviews of the status of conservation efforts from across Europe, as well as in China and India. The efforts from China seemed in many ways unrivalled, perhaps due to the great economic stock Fungi seem to have there; a result of their wide use in the cuisine and medicine of China. Eastern European countries are also well represented in fungal diversity and their population and governments are similarly mycophylic (fungus loving). This is reflected in the wide legislation for and consideration of Fungi in red-lists (lists of species in need of conservation efforts) of Russia, Poland, and Germany in particular. Special thanks must go to EMA president, David Minter, who remained vocal about the need for us mycologists to be politicians as well as scientists in order to aid the challenges of having fungi taken seriously, and not as an extension of plants. As well as Anders Dahlberg of Sweden who introduced us to the need for the Global Fungal Red List Initiative. Here, people with relevant knowledge can update fungal species profiles in order to assess their conservation needs to IUCN standards. And finally, to the co-chair of the ECCF, Susana Gonçalves, for stepping in to guide the ECCF and propose an interesting and achievable direction for the council’s future. Certain sites were recommended for mining for fungal data and included: Cybertruffle, GBIF, USDA, and MycoPortal. The programme also included local wine tasting, a gala diner complete with local music and dancing, talks on projects utilising citizen science (particularly shown by my future project at Kew Gardens – The Lost and Found Fungi Project), and excursions to the St. Naum Monastery, Ohrid town centre, and the Pelister National Park. A packed and useful week it certainly was. Anders Wahlberg, champion of the red list, presenting the many services Fungi provide us with. EMA president, David Minter; hands up for conservation! ECCF co-chair, Susana presenting her vision for ECCF future directions. My favourite poster: ethnomycology of Greece. President with the Macedonian organisers. Results of the foray to Pelister National Park. The monastery at St. Naum. Beautifully clear water of Lake Ohrid. This entry was posted in PhD research, Public Engagement with Science, RHS research and tagged #PowderyM, Conference, conservation, ECCF, EMA, Erysiphaceae, Erysiphales, European Council for the Conservation of Fungi, European Mycological Association, Fungal conservation, Fungi, Fungus, FYROM, International Society for Fungal Conservation, ISFC, IUCN, Macedonia, Ohrid, Oli Ellingham, Oliver Ellingham, Powdery Mildew, Red list. Bookmark the permalink.